Gaelynn Lea Tressler of Duluth, Minnesota discovered her love of music back in 4th grade when the orchestra came to her school. She fell in love with her first musical instrument, the cello. Finding the cello too large to play, Gaelynn used creativity to figure out how to have a relationship with this instrument, and that began her journey of playing the cello as a violin. When she plays, she says it’s a spiritual experience and feels connected to something bigger than herself. Born with Osteogenesis Imperfecta, or brittle bones, Gaelynn experienced many fractures while in utero. Her legs and arms are small, and because most of her fractures occurred in her arms, this has made playing the violin in its traditional form more challenging and so playing as a cello just made more sense. Gaelynn plays traditional Celtic music layered with the looping pedal, which is a little box that allows her to press down on the button and record. This box allows her to add layers of sound to her music and give it new depth. In addition to playing, Gaelynn sings as a mezzo soprano and, during her high school years, played classical music. After school, Gaelynn wanted to continue playing, but not with the orchestra, so she joined a fiddle group and played through college which included 5 or 6 in a group. For about three years, Gaelynn taught violin to kids and adults and the music of choice was fiddle music. Her youngest student was six and her eldest was sixty-seven. Currently, she is taking time off to tour and will be on the road during the October and November 2016 months and then next year beginning in January and last in March. Her East Coast gigs will include The World Café in Philadelphia PA this October 25th and New York October 26th. Her winter months will take her South to perform and then she will head to the West Coast and Canada during her spring tour. During Gaelynn’s college years, she attended Macalester University in MN, but in truth wanted to move out of state and live in CA. Her goal was to attend the Main University which included 50,000 students, but her mom did not want her to go away and attend such a large school. So, to compromise, Gaelynn agreed to attend Macalester which is small, offers a great education and is accessible. But during her time there, she developed a respiratory issue that became serious and so was unable to finish her degree in Political Science and minor in Psychology. So once able, she finished her degree at the University of Minnesota in Duluth and received her BA in 2008. 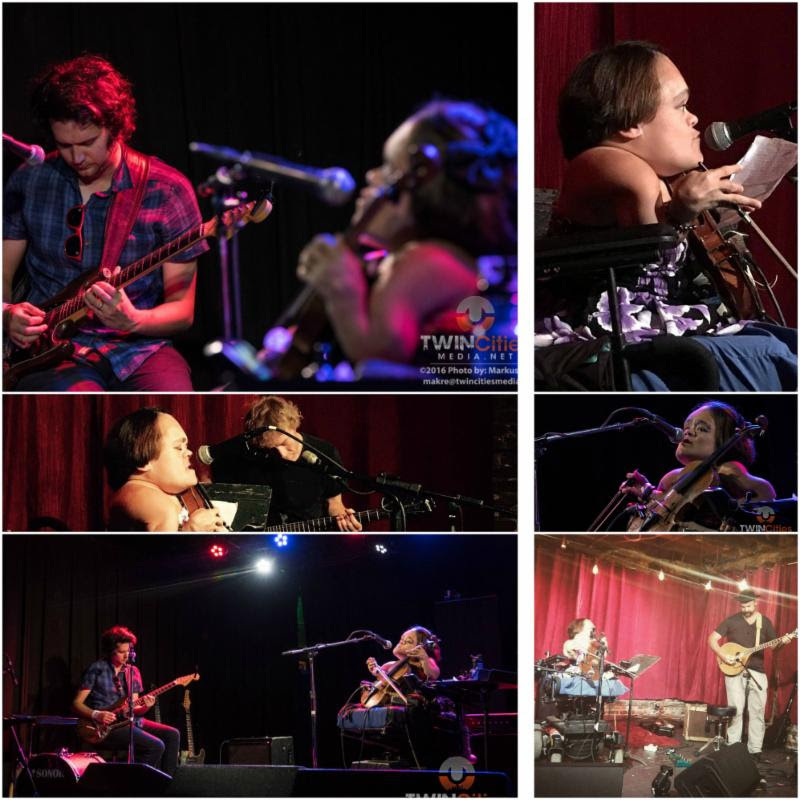 During her time of finishing her degree, Gaelynn met her husband Paul at a Tavern while playing music. They met and got to know each other through friends, dated for seven years and have been married now for three. Currently he is traveling with her while on tour and has a beloved Spaniel Clara aged seven. One of the highlights of Gaelynn’s life occurred this past year when she entered a contest with NPR, in which she had to produce an original song on video. The contest was titled "Tiny Desk" and so the idea was that one would have to produce their video in front of a desk. On March 11th, she found out that she in fact won and beat out 6,000 applicants, all from within the U.S. Her reward was to play for a podcast and have a four-city tour which included New York, Chicago, CA and Portland. Her interview occurred in Washington DC. For Gaelynn, playing music is very therapeutic and, after being sick during her college years at Macalester, offered her a calmness to ease her anxiety. But she also goes on to say that music is simply lots of fun and a form of expression that her whole family partakes in. Her parents work and produce for a dinner theater in which she and her siblings were involved in while growing up. Her mom played piano and her dad the guitar and trumpet. She has three siblings in which she is the third in line and her younger brother plays guitar and writes music of his own. All of her siblings are in MN, but not in the same town where she currently lives. One thing Gaelynn would like people to know regarding her love of music, is that it does not have to be about how good you are, but about something that is fun, expressive and therapeutic. Two of her students will not play for an audience, but love music and play alone in their garage. She says that she has never had students with disabilities before, but would have loved it if the opportunity occurred. And one thing the NPR interview offered and goes on to show the power of social media, was its ability to inspire teachers how to work with students with disabilities. She loves that people come up to her and tell her that the music she plays is emotional and she loves to look out into the audience to see that many include people with disabilities attending her show. If free on the 25th, I hope people will take the opportunity to attend her show. I’m sure it will be a magical night and one not soon forgotten. For more information, visit Gaelynn's website at https://violinscratches.com.